After playing The South Course, we checked in to the Lodge and made a 6:45pm reservation for dinner at the restaurant. We sat outside on the patio to eat, which was hot in the direct sun, but worth it for the views and the atmosphere of the place. At 7pm, the bagpiper came out and played for 20 minutes. Then at 8pm (yes, we were still eating), he came out and played until sunset, which was about 40 minutes. It was spectacular. I was drinkng Coconut Coffee Rubenesque made by Starving Artist Brewing Company, which is one of the best beers I’ve ever had. I got Pork Belly for a starter, Chilean Sea Bass for dinner, and a warm chocolate chip cookie with coffee ice cream and fudge for dessert. Amazing meal! In the morning we fueled up on the breakfast buffet, hit some balls on the range, and tried a few shots out of the practice pot bunker. It was quickly decided that we should do everything possible to stay out of the bunkers on the course. After hitting some putts on the practice green I could tell right away the green was much faster than over at the South, even with it being wet from overnight watering. The Bluffs, which opened in 1999 has been on my Michigan golf bucket list for a long time. 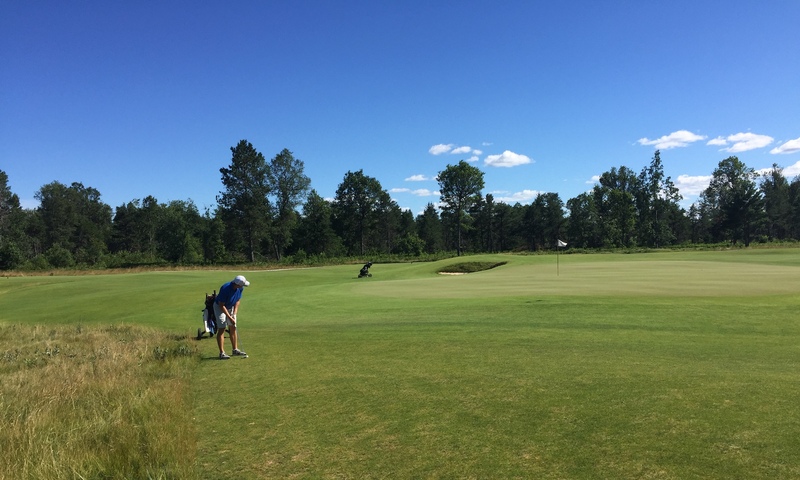 After nearly 20 years it is still ranked #13 in Golf Digest’s list of America’s 100 Greatest Public Courses and #3 in their list of Best Golf Courses in Michigan. That says a lot about the course. The carts have the nice GPS screens, but we still wanted a yardage book, which cost $6. I don’t understand why they don’t throw these in your cart like the South course, especially when you’re paying almost $200 a round. The course is absolutely incredible. There is nothing I can say or show that would give you the feelings you get as you drive around the course and experience the view with each hole. It really takes your breath away. The course starts with a par five and three of the first five holes are par fives. As a long hitter I really liked that and it gets you in to your round. The front nine also has three par threes, making par still come out to 36 for the side. I started out bogey-par-birdie before 3-putting three of the next four holes. Did I mention the greens are fast? I settled in with the putter after that only making one more 3-putt. This is the type of course where I have to play a lot of target golf to score well because I don’t have the game where I can just rip a driver on every hole. Thankfully I love target golf and was playing well this day. I hit 8 fairways (with a few others just rolling into the rough) and 8 greens in regulation. Shot 41-42 with 18-16 putts and wasn’t in a single bunker! My favorite holes were probably 11, 12, and 13, which are all along Lake Michigan. I was surprised at how little the wind affected us. We had to adjust a lot more the day before when we played the South Course. This place is really something you have to see for yourself. It seemed like every time we turned a corner or come up over a hill we were in awe of the view. The course layout was fun, challenging, and had a good mix of directions and elevation changes. I don’t remember ever feeling like something was a gimmick. We’re already talking about going back next summer. I’ve wanted to play at Arcadia Bluffs for years and this summer was finally the time. When looking at the course, Jere and I noticed The South Course was opening August 1st, so we decided to stay the night on the property and play both courses. Golf Digest did an early review of the new course. We arrived a couple of hours early, but our room wasn’t ready yet, so we ran out for a quick lunch. The driving range isn’t open yet at the South, so we drove over to the Bluffs to hit some balls and then drove over to the course, which is about a mile down the road. As we drove we couldn’t see many people out on the course and the parking lot wasn’t anywhere near full. We checked in, had time to hit a few putts, and headed over to the first tee. They actually give you yardage books, which is extremely rare. Even when you’re paying over $100 to play the courses usually make you buy the yardage book. With the limited time we had on the putting green, I was impressed with how firm, fast, and true it ran. With the course not even being open for three weeks yet, I wasn’t sure what to expect. We were only a twosome, so we got paired up with an older couple. They were walking and each paid to have a caddie. They were nice folks, but they obviously play courses like this all the time and enjoy a much higher cost of living than us. Having six people in our group was annoying at times, especially on the greens. There were a few times where we overheard a tip about the course or their caddies pointed something out to us as well, but I’d much rather just have a group of four on the course. The tees, fairways, traditional rough, greens, and bunkers were all in excellent shape. You’d never know the course just opened. When you got off the rough into the heather, that stuff was all still extremely new. When it grows in, the course will play a lot different in a couple of years. The course is extremely flat and runs fast. It’s a different style of golf, which is a fun challenge. I really liked the greens and my speed was great all day, except for the single 3-putt I had. I had a hell of a time in the bunkers though, and almost every green was heavily guarded by them. If your ball was near the edge by a bunker, it almost always rolled off and into the sand. Most of my bunker problems seemed to start on the par three 5th hole. I hit my first bunker shot past the hole, it kept rolling and went in the bunker behind the green, Then I did the same thing coming back and went back in the original bunker. Then I barely made it out of the green, it rolled back and thankfully got caught up in the sidewall. I ended up taking an 8 there! After that I think I got in my head and I had several bunker shots that I hit too much sand and didn’t get out. In addition to the 8 I had three 7s, which killed my score. I shot 48-45 from the white tees, which play 6,380 yards. Overall we enjoyed the course and it was cool being some of the first people to ever play it since it was so new. I’m not sure I’d pay that kind of money ($100 since we were staying on Arcadia property) to play there again though. I’d much rather go back and play The Loop at Forrest Dunes. Really glad we played The South Course first though, before playing The Bluffs on Sunday. It allowed us to judge the South on its own, which is a much different type of course. What an incredible weekend at Arcadia Bluffs. I’ll have more to say and show about the courses, but here is a video to give you a taste of the sunset over Lake Michigan. Pictures and videos can’t do this place justice though. Incredible. Our family always had fun playing our own version of Michigan Rummy (there is also a version called Tripoly) as kids. Then last year we played it almost every night on our family vacation, using a modified board. It gave me an idea to build a custom board for my Mom. As soon as I saw this case with two decks of cards at an estate sale several months ago I knew it would be neat for the board. I think I paid $1. The copyright date is 1947! I’ve been wanting to build something with pallet wood and thought it would give the board a neat look. You can get free pallets all over by looking on Facebook Marketplace or Craigslist. With the help of my pallet buster and some brute force, I broke down the pallets. These containers with covers are from Menard’s, free after rebate. Another perfect piece for the project. I laid everything out to get a feel for the size. After taking measurements, I mocked up a 3D model of the board’s top layer in SketchUp. It would be about 24×16 inches. I also printed out the text using Arial Black for the letters/numbers and Futura for the suit symbols. I trimmed, planed, and jointed a bunch of boards. Then glued up panels that would make the top and bottom of the board. I measured and marked a bunch of lines and then placed everything where it would end up to get a better feel for the size and layout. I liked it. I finished drawing in more details and did a rough cut of the outer shape with my band saw. The scroll saw got heavy use cutting everything out. I also cleaned up the holes and edges with various sandering. You can see a couple of places where I started to carve in the text. It didn’t take long to scrap that plan though; it was going to take forever and some of the wood was really soft so I wasn’t happy with how it would turn out. I decided to use raised letters that I’d glue on. After doing a bunch of work, I realized this would be much better because the containers would be up above the board, so it would have been hard to see the recessed lettering. I used the band saw to cut all of the letters. More sanding to clean them up and then some spray paint. I didn’t get any pictures of the next steps, which probably took the longest. I used a bunch of the cutoffs to build up an outer support ring as well as eight stacks in the middle to prevent something heavy from breaking the top or bottom panel. There was a lot of gluing, clamping, and band saw trimming. Finally I had enough layers and I was able to glue on the bottom panel. After the glue dried I did a lot of sanding on every surface. I had tied in a piece of bungie cord earlier that would hold the card case in place. Then I drilled shallow holes so I could glue in (with epoxy) rare Earth magnets to hold the containers in place. I used CA glue to attach all of the lettering. It was finally time for some finish. I used three coats of shellac (with light sanding after each coat) and a coat of wax polish. I spray painted the Michigan map on half of the containers and gave them two clear coats. The last thing was to stick some of those felt pad circles to the bottom and it was done. I really like how this turned out. The layering you can see from the sides is a neat look. Remember when everyone kept a map in their glovebox? This old Michigan map was in a stack of documentation the seller gave me when I bought the ’68 truck. The 1960 Census info on this map had Rogers City with a population of 4,722 and 98,265 for Saginaw. Quite a difference from 2,827 and 51,508 in 2010.